Hi! I'm Lindsey - and I've had a yoga flirtation since my teens. It's always SEEMED a good thing - but I wasn't sure it was MY good thing. I tried several different styles of yoga – and I appreciated the benefits, but often found myself bored... with my mind drifting into my “to-do” list. Plus, if I was going to invest one of my precious 24-hours to do a work out, I wanted to TOTALLY SEE and FEEL the benefits; I had a difficult time figuring out how to "make" yoga work for me. I'm pretty active: a runner with several half-marathons in my (pretty slow) wake, and I also train with weights several times a week - so I knew I was courting injury with my "crusty rubber band hamstrings" and general lack of flexibility. And on top of that... I was freaking stressed out; juggling a corporate job with an avid social life left me delivering a less-than-nice version of myself to those I love the most. Teaching yoga fits me. I'm honored to GET to do it. I LOVE helping people. I LOVE learning more about living life from the inside out (and not the other way around... it takes freaking work, y'all). I LOVE when I GET to be with someone when they try something they NEVER thought they'd do - and they surprise themselves. I also LOVE when we all get messy. That's the work, that's the fun, that's the growth. My personal mission statement is "To Leave a Positive Wake From the Inside Out" - so this teaching yoga thing is an awesome outlet. Thank you for your spirit and light and strength and power! I see you - you are seen. 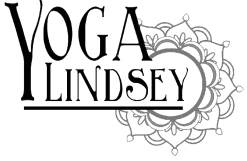 Learn the styles of classes and workshops that Lindsey is teaching - and WHERE! Need some one-on-one or some small group classes to get started or over an injury?